Bands: Standard bands B, C, D, G.
Packaging: Varnished Boîte Nature Box of 25 cigars. Cardboard Pack of 5 cigars (discontinued 2013). Cardboard Pack of 3 cigars (discontinued pre-2000). Varnished Boîte Nature Box of 25 cigars in cellophane (discontinued pre-2000). Varnished Boîte Nature Box of 50 cigars (discontinued pre-2000). Varnished Boîte Nature Box of 50 cigars in cellophane (discontinued pre-2000). Dress Box of 25 cigars in cellophane (discontinued c1982). Dress Box of 50 cigars in cellophane (discontinued c1982). Status: A 1964 release. Current. Bands: Standard bands B, C, D.
Packaging: Cardboard Pack of 5 cigars. Varnished Boîte Nature Box of 25 cigars. Cardboard Pack of 3 cigars (discontinued pre-2000s). Varnished Boîte Nature Box of 25 cigars in cellophane (discontinued pre-2000s). Varnished Boîte Nature Box of 50 cigars (discontinued pre-2000s). Varnished Boîte Nature Box of 50 cigars in cellophane (discontinued pre-2000s). Dress Box of 50 cigars (discontinued c1982). Dress Box of 25 cigars (discontinued c1982). Status: A 1967 release. Current. Packaging: Cardboard Pack of 3 cigars. Varnished Boîte Nature Box of 25 cigars (released c2003). Varnished Semi Boite Nature Box of 25 cigars (discontinued c2003). Status: A 1989 release. Current. Packaging: Cardboard Pack of 5 cigars (released early-1990's). Varnished Boîte Nature Box of 25 cigars (released c2006). Varnished Semi Boite Nature Box of 25 cigars (discontinued c2006). Varnished Semi Boite Nature Box of 25 cigars in cellophane (discontinued early-1990s). Cardboard Pack of 5 cigars in cellophane (discontinued early-1990s). History: In c2002 the Seoane vitola was reportedly changed to a 33 x 126 size. Packaging: Varnished Slide Lid Box of 25 cigars. Cardboard Pack of 3 cigars in aluminium tubes (released 2014). Bands: Standard bands C, D, G.
Varnished Slide Lid Box of 25 cigars. Cardboard Pack of 3 cigars in aluminium tubes (released c2008). Status: A 1994 release. Current. Bands: Standard band C, D, G.
Cardboard Pack of 3 cigars in aluminium tubes (released 2008). Varnished Slide Lid Box of 10 cigars. Status: A 2002 release. Current. History: In 2010 a ceramic jar of 25 cigars were produced locally for W.Europe. In 2011 a gift pack of 15 Tubos were produced locally for W.Europe. Cigars: Handmade. Maduro wrapper aged 5 years; binder & filler aged 3 years. Packaging: Black lacquered Boîte Nature Box of 10 cigars (released 2007). Black lacquered Boîte Nature Box of 25 cigars (released 2007). Status: A 2007 release. Current. History: In c2009, 500 Humidors containing 20 of each of the three current Maduro 5 cigars, were produced locally for the Swiss market. History: These cigars were included in the 2009 Swiss Humidors. Cigars: Handmade, using maduro wrapper aged 5 years, and binder & filler aged 3 years. Cigars: Handmade, incorporating the scarce Medio Tiempo leaf. Packaging: Black lacquered Boîte Nature Box of 10 cigars. Status: A 2010 release. Current. History: Behike is the fourth line of cigars in the Cohiba brand. Packaging: Varnished Boîte Nature Box of 10 cigars. Cardboard Pack of 3 cigars in aluminium tubes (released 2013). Status: A 2012 release. Current. History: This cigar forms part of the Classic range. Cardboard Pack of 3 cigars in aluminium tubes. Status: A confirmed 2016 release. Not yet available. Packaging: Varnished Semi Boite Nature Box of 25 cigars in cellophane. Status: A 1988 release. Discontinued 1992. History: Reportedly discontinued because of a size overlap with the introduction of the Siglo Series. Bands: 1964 to 1969: Gold on white custom & general purpose bands were used. 1969 on: Standard bands have been used. Packaging: Various packing as shown. History: Diplomatic Gifts are given by the Head of State to other Heads of States. History: Produced and gifted to government officials and selected VIPs. Status: A 1994 release. Extremely rare. History: Approximately 200 singles were gifted during the dinner and the ten boxes of each were auctioned. Bands: Special 30 Aniversario band. Packaging: Humidor of 50 cigars (45 made). History: Released to commemorate the 30th Anniversary of the Cohiba brand. Includes a numbered certificate. Packaging: Numbered Ceramic Jar of 25 cigars (1,000 made). History: Released to commemorate the 30th Anniversary of the Cohiba brand. Cigars: Handmade. Reportedly all wrapper leaf tobacco. Packaging: Humidor of 90 cigars (30 made). History: Produced for the 1997 Cohiba 30th Anniversary celebration party in Havana. Includes a numbered certificate. Bands: Special Reserva del Milenio 2000 band. Packaging: Ceramic Jar of 25 cigars (10,000 made). 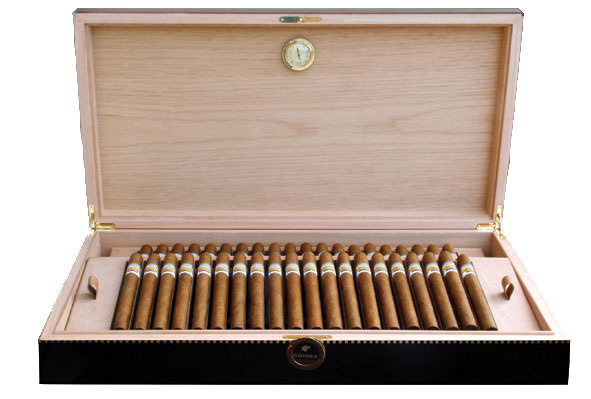 Packaging: Numbered Special Humidor of 2000 cigars comprising 20 brands (21 made). History: Free-standing electronic (temperature & humidity controlled) humidor made to commemorate the Millennium. It contains 20 brands and 2,000 cigars. Bands: Special 35 Aniversario band. Packaging: Numbered Humidor of 135 cigars (500 made). History: A number of similarly banded Gran Corona, Robusto, and Siglo II cigars were gifted at the 2001 Habanos Festival dinner. Cigars: Handmade. Wrapper aged 2 years. Bands: Standard band C, with Limited Edition 2001 band. Packaging: Varnished Semi Boite Nature Box of 25 cigars. Status: A 2001 release. Not available until 2002. Cigars: Handmade. Tobacco aged 3 years. Bands: Special Siglo X Aniversario band. Packaging: Numbered Humidor of 90 cigars (500 made). History: 10th Anniversary of the introduction of the Siglo range. Bands: Standard band D, with special 510 Aniversario second band. Packaging: Numbered Humidor of 100 cigars (510 made). History: To commemorate the 510th Anniversary of Christopher Columbus transporting tobacco back to the Old World. It contains 5 brands and 100 cigars. Bands: Standard band D with 2003 Limited Edition band. Cigars: Handmade. Filler tobacco aged a minimum of 3 years before rolling. Bands: Standard band D, with special Reserva second band. Packaging: Varnished Boîte Nature Box of 30 cigars. Status: A 2003 release. Boxes date from late-2002. Packaging: Selection Box of 5 cigars comprising 5 brands. Status: A 2003 release. Released annually. Contains 5 brands. Packaging: Humidor of 50 cigars (100 made). History: Released (late) as part of the celebration of Cohiba's 35th Anniversary. Bands: Standard band D, with Limited Edition 2004 band. Cigars: Handmade, by a single Roller. Bands: Standard band D, with special numbered Behike second band. Packaging: Numbered Humidor of 40 cigars (100 made). History: Released to commemorate the 40th anniversary of the Cohiba brand. Bands: Standard band D, and 2006 Edición Limitada band. History: The fifth Anniversary of the Limited Edition Series (a re-release of the 2001 Pirámides). Packaging: Numbered Humidor of 90 cigars (50 made). History: 10th Anniversary of the first humidor produced by the Guayasamin Foundation. Packaging: Numbered Book-shaped Boîte Nature Box of 20 cigars (1,000 made). History: The eighth release of the Habanos Collection Series. Cigars: Handmade, using tobacco from the 2003 harvest. Bands: Standard band D, with a special Grand Reserve second band. Packaging: Numbered Black lacquered Boîte Nature Box of 15 cigars (5,000 made). History: The cigars are made with selected 2003 tobacco leaf from San Juan y Martínez and San Luis regions, and were rolled at the El Laguito factory. Bands: The Genios has standard band E. The Siglo VI has standard band D. Both have a special X Festival del Habano second band. Packaging: Black lacquered Boîte Nature Box of 10 cigars comprising 9 brands (20,000 made). Status: A 2009 release. Boxes date from DIC 08. History: This release is a replica of a special commemorative case gifted to attendees of the tenth Habanos festival in Cuba. Packaging: Numbered Book-shaped Boîte Nature Box of 30 cigars (1,000 made). History: The 11th release of the Habanos Collection Series, comprising 10 brands with three cigars in each brand. This release is titled "Obras Completas" (the Complete Works). Cigars: Handmade, using two year old aged tobacco. Bands: Standard band D, with Limited Edition 2011 band. History: This Limited Edition also commemorates the 45th anniversary of the Cohiba brand. The tobacco has been selected from the finest areas of the Vuelta Abajo region; that of San Juan y Martinez and San Luis. Packaging: Selection Box of 10 cigars comprising 5 brands (5,000 made). Magnificos - a new special release size. Bands: Standard Band G, with Limited Edition 2014 Band. Packaging: Varnished Slide Lid Box of 10 cigars. Grandiosos - a new special release size. Bands: Special 50th Anniversary band, with special old Cohiba-logo foot cap. Packaging: Numbered Humidor of 50 cigars (50 made). Majestuoso 1966 - a new special release size. Bands: Standard band G, with special Cohiba 50th Anniversary band. Packaging: Numbered Humidor of 20 cigars (1,966 made).